A gun battle between rival gangs terrorizes shoppers at a Miami mall, but Mack Bolan knows that cleaning up the mess in Florida is just the beginning. One gang's main operation leads back to Jamaica, where its drug trafficking business is flourishing. And so is the practice of voodoo and human sacrifice. Infiltrating the gang on its own territory is a deadly challenge. With most of the island on the cartel's payroll or too afraid to come forward, Bolan's only ally is a Kingston police officer. 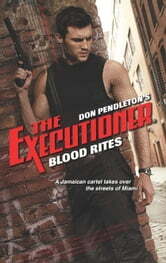 But no matter the odds, the Executioner will do whatever it takes to bring down the drug lord and his army of killers.